One source for the Ambisia story was the quantum mechanical (QM) cat in the box paradox devised by Schrödinger. In Schrödinger’s thought experiment, a microscopic QM event is used to kill a cat in a sealed box. The event might be the emission of a subatomic particle and then using it to fire a gun, release poison etc. The paradox is that there is a certain probability that the cat-killing particle will be released in a certain time, and evidently the QM state of the cat in the box is mixed, ie, it contains superimposed QM wave functions representing both a living cat and a dead cat. When the cat owner opens the box, they see one or the other state, and depending on what they were hoping for, they might be disappointed. who cares who owns the cat? An event where superimposed QM states condense into a single state is called the collapse of the wave function. In some interpretations, the role of the cat owner (who opens the box and observes the cat) is believed to be important in the collapse, and some researchers have even postulated QM states in the brain. The mundane and probably correct explanation has nothing to do with the cat owner. Long before anyone opens the box, the environment around it comes into play—sound, vibration, heat and radiation all affect what’s inside. The random input from the external world quickly destroys the coherence of the QM wave functions, and for all intents and purposes, the cat is alive or dead, but not both. This interpretation has a connection with the arrow of time, or the direction in which time is perceived to run in the world. On the microscopic QM scale almost everything is reversible—QM events can run equally well forward and backward in time and don’t provide a direction for time’s arrow. On the other hand, the death of Schrödinger’s cat has a clear direction in time. Dead cats don’t come back to life unless the zombie apocalypse is under way. The collapse of superimposed QM states has a clear direction in time as well, because there is no uncollapse. On the macroscopic scale (you, me, cats etc), the Principle of the Independence of Incoming Influences1 PI3 plays a pivotal role in setting the direction of time’s arrow. PI3 says that all the small environmental influences that affect the box are basically independent of each other, and they don’t all act together to make something weird happen, like zombie cat. 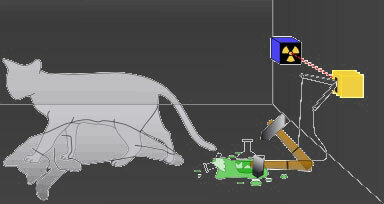 The connection with the cat in the box paradox is that exactly the same PI3 effects actually cause the QM collapse, the death or survival of the cat, and the transition from the time-reversible world of quantum mechanics to the real(ish) world where things die and generally stay dead. 1. “Time’s Arrow and Archimedes’ Point” by Huw Price, Oxford, 1996. This entry was posted in online non-fiction, science fiction science and tagged non-fiction. Bookmark the permalink.